MainOpEdsWhen Palestinian Arabs cry "Humiliation"
When Palestinian Arabs cry "Humiliation"
Time to protest the fact that an entire population is harassed by body checks at malls and supermarkets, car inspections at parking lots and worse. In addition to stabbings, car ramming and suicide bombings that have been frequently occurring at checkpoints, Palestinian Arabs claim they feel humiliated and harassed when Israeli authorities search them and their belongings; when they are prevented from traveling freely because of checkpoints, roadblocks, closures and curfews. They say they feel corralled behind security fences and ugly concrete walls. Meanwhile in Israel, Israelis are searched numerous times during the course of a day. Israelis are asked to open their bags and purses for inspection. In most cases, they are subjected to body searches with a metal detector every time they enter a bank or a post office, pick up a bottle of milk at the supermarket, enter a mall or train station, or visit a hospital or medical clinic. As a matter of routine, Israelis' car trunks are searched every time they enter a well-trafficked parking lot. Not one U.N. organ has protested the fact that, for years, an entire country has been harassed and humiliated. 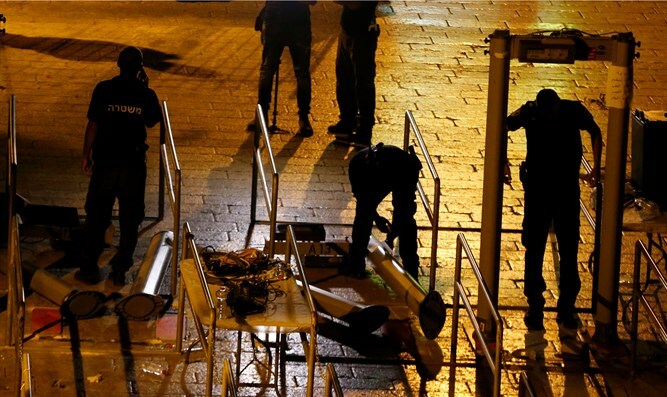 Israelis are searched not only when they go out for a cup of coffee at the local Coffee-shop, but also when they go to the movies or the theater or a concert, where the term "dressed to kill" has an entirely different meaning. These ordinary daily humiliations now extend to similar searches when Israelis go to weddings or bar mitzvahs. No one abroad talks about the humiliation Jews in Israel are subjected to, having to write at the bottom of wedding invitations and other life cycle events, "The site will be secured [by armed guards]" - to ensure relatives and friends will attend and share their joyous occasion. To date, no one protests the fact that Jewish schoolchildren in Israel are surrounded by perimeter fences with armed guards at the schoolyard gates. Not one Arab village in Israel or the Territories has a perimeter fence around it. Guards are not required at Arabic shops, cafes, restaurants, movie theaters, wedding halls or schools - either in pre-1967 Israel or in Judea and Samaria. Palestinians also do not need armed guards to accompany every school trip, youth movement hike or campout. They are not targets of terrorism. Israelis are told, in effect, to disguise themselves when traveling abroad - not to speak Hebrew in public and not to wear garments that reveal their Jewish/Israeli origins. On the other hand, Arabs who frequent Jewish cities and towns in Israel wear their traditional Arab headgear without fear of being attacked or harassed. Even Israel's national airline - El Al - has been forced to remove its logo from the tails of its aircraft at certain airports, out of concern for the safety of its passengers. This followed several attempts to down Israeli civilian aircrafts with missiles - one of which blew up a Swissair flight in mid-air from Zurich to Tel Aviv in February 1970, killing all 47 passengers and crew aboard. All this begs the question: Who are the victims and who are the victimizers? Who are the ones being harassed and humiliated? Palestinians or Israelis?